The US team pulled off yet another distinctly American win, this time against their arch-rivals in a game played predominantly down the flanks. 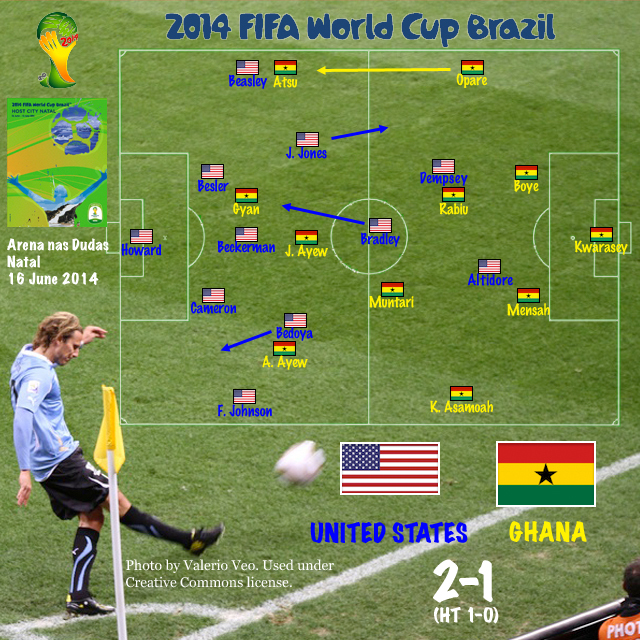 German-born players played a critical role for the US (though Kevin Prince Boateng did his part for Ghana as well), while the full-backs were the key figures for Ghana. It’s difficult to know for sure what Jürgen Klinsmann’s game plan would have been had Clint Dempsey not scored the fifth- or sixth-fastest goal in World Cup history. It’s clear, though, that the US fielded a much more defensive midfield diamond than in any of their build-up games. The more defensively disciplined Kyle Beckerman took over the holding role usually played by Jermaine Jones; but Jones was deployed out left–to my knowledge, for the first time. The right was occupied by Bedoya, whose performance on the day suggests that he, too, was chosen for his defensive qualities. One suspects that this defensive three were planned to free Michael Bradley to serve as a creative link in a 4-3-1-2; but with the early goal, Bradley dropped back alongside Beckerman to take up something more like a box-to-box role in a 4-4-2. Though the introduction of Aron Jóhannsson for Jozy Altidore at 23′ and of Graham Zusi for Alejandro Bedoya at 77′ each changed the style of play significantly, they did not alter the US formation. Ghana were set up in their usual 4-2-3-1, but with their near continuous possession this shifted increasingly to a 4-3-3 as Sulley Muntari moved forward (André Ayew often pinched inside from the left as well, as is his wont). As with the US subs, Kevin Prince Boateng injected new energy but did not substantially alter Ghana’s formation, nor did Albert Adomah. Jermaine Jones (US) vs. Daniel Opare (Gha) – It’s safe to say that the game was won and lost down the United States’ left and Ghana’s right flank, where the key battle was between Jones and Opare. Jermaine Jones has gotten significant praise for his defensive work in the game (from World Soccer Talk, Outside of the Boot, and both the writers and the online community at American Soccer Now), and rightly so. It’s important to note, however, that he did so while maintaining a relatively high position on the pitch, contributing significantly to the US attack as well–including the nice one-touch pass to Dempsey that allowed him to get into scoring position. Though he also helped DaMarcus Beasley with the widely (and rightly) praised Christian Atsu, much of Jones’s defensive effort was focused on Ghana’s right back, Daniel Opare. Michael Cox described Opare’s game as “arguably the worst individual performance of this tournament so far,” and his analysis focused on Opare’s deplorable crossing. Indeed, without Opare’s crosses, Ghana’s cross completion rate improves from 34% to 41%. But Opare was also his team’s most influential passer down the right flank–feeding not only Atsu (20 passes) but even more importantly Asamoah Gyan (11 passes) with significantly greater frequency than any of his teammates. Had Opare done a better job, it might well have made the difference for Ghana; but he was still one of their two most influential players, if not entirely for good. Kwadwo Asamoah (Gha) vs. Fabian Johnson (US) – On the other flank, Asamoah was far more effective but for the most part less influential. He completed 51 of 56 passes, a 91% pass completion rate. His passes were also more conservative passes up and down the flank or shorter inside passes. A notable exception, of course, was his brilliant penetrating pass into the box to feed Gyan’s back-heeled assist of André Ayew’s goal. For the most part, however, Ayew was ineffective and Gyan’s movement was predominantly to the opposite flank. Asamoah had an excellent game, but on the flank less travelled. Probably in response to Asamoah’s effective passing, both Alejandro Bedoya and Fabian Johnson spent most of the game penned back in deep defensive positions. Bedoya’s deep positioning was in marked contrast to Jones’s on the opposite flank, and it probably contributed to limiting Ghana’s impact on this side of the field. This dynamic was dramatically changed by the introduction of Graham Zusi for Bedoya at 77′. Zusi added much needed fresh legs for the US, but he was also much more offensively oriented than his predecessor. This had drawbacks as well as advantages: it is probably not an accident that Ghana’s equalizer came after Zusi’s introduction, especially since he was, in fact, the one marking Asamoah on the entry pass. But Zusi’s forward positioning also seemed to encourage Fabian Johnson in getting forward. This was particularly clear after the equalizing goal, but it’s worth remembering that the United States’ best chance of the half (before their late goal) was a 79′ attack up the right flank involving Zusi, Beckerman, and Johnson, that ended in a shot for Dempsey from the top of the box. Brooks’s set piece goal, too was off a corner created by another Johnson run (and was delivered by Zusi). So with one goal conceded and one created, it will be especially interesting to see whom Klinsmann chooses at right midfield to help combat the threat of Cristiano Ronaldo. Asamoah Gyan (Gha) – Gyan had five shots, but only one was on target. For all the excitement about Portugal’s depleted back four, it seems unlikely that Ronaldo, given similar chances, will have the same result. The US will have to play a much better game this Sunday if they hope to advance from the group. NOTE: I realized after creating my formation map that Ghana was listed as the home side. Looks like I’m a lazy American as well as a stoopid one, because I’m definitely not fixing it.